This post is created in partnership with The Fruit of the Land store. I received their product for free but all the delicious opinions are my own. Up until I came to Canada in mid-90s, my only experience with cranberries was in the form of a delectable Russian confection: cranberries in icing sugar shell. They were sold in small cardboard boxes, lined with thin wax paper. Unwrapping it usually sent a cloud of puffy icing sugar into the air and it instantly smelled like happiness. Each powdery white sphere, so much like a tiny snowball, contained a whole cranberry. They popped and squirted tart juices in your mouth and melted into the sugar shell, creating a perfect sweet and sour dance on the tongue. Now, I love using cranberries in both sweet and savoury dishes. They add a wonderful contrast to meats, vegetables, and sweet desserts. Cranberries are so beautiful and they often stay whole even after cooking, creating that wonderful textural contrast when they are bitten into. I often spend days trying to develop a recipe. I have a few that I’ve been working on for a few months now and I just can’t get them right just yet. And then there are recipes, like this Instant Pot Maple Cranberry Sauce, that work amazingly well from the first try. And then I cook them again and again and I don’t want to make any changes to them. 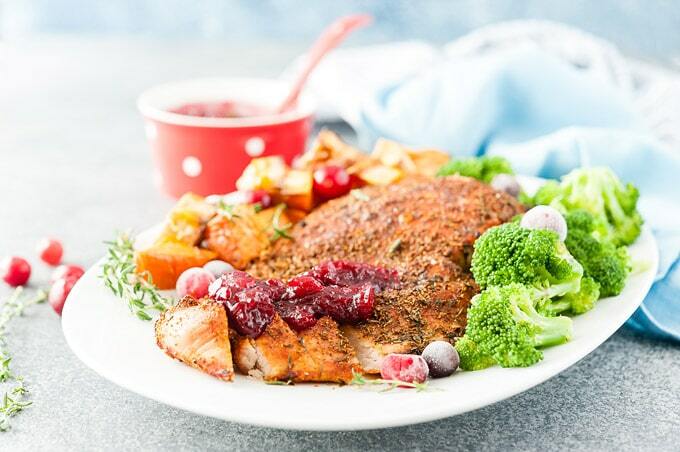 I love cranberry sauce with turkey or even chicken and I usually make my own on the stove. No real proportions, just some cranberries, sugar, maybe a bit of orange juice. I then cook and stir and cook some more. It’s not difficult or terribly complicated but it takes some effort of constantly stirring to make sure that nothing boils over or burns. That’s why when I came up with the idea of making Instant Pot Cranberry Sauce I felt really excited. This Maple Cranberry Sauce is lightly sweetened and beautifully tart. 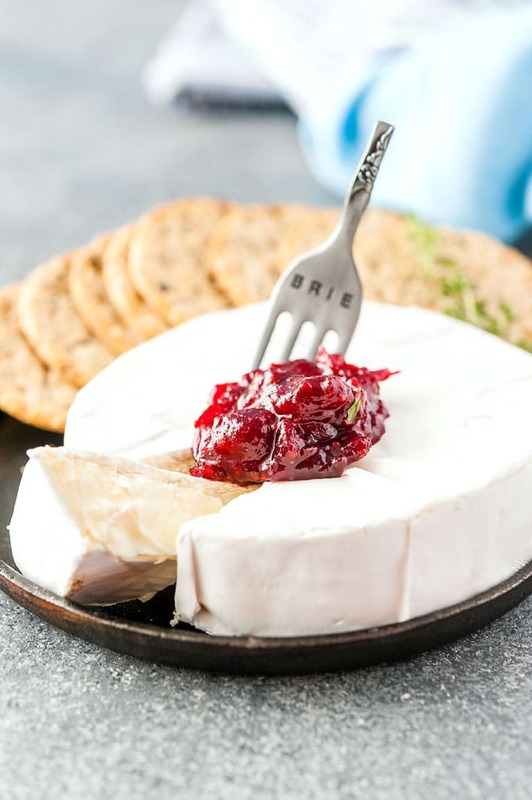 It’s a delicious accompaniment to Thanksgiving turkey, cheese platter, or even your morning toast. Easy and so versatile! 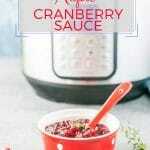 Why make Cranberry Sauce in Instant Pot? 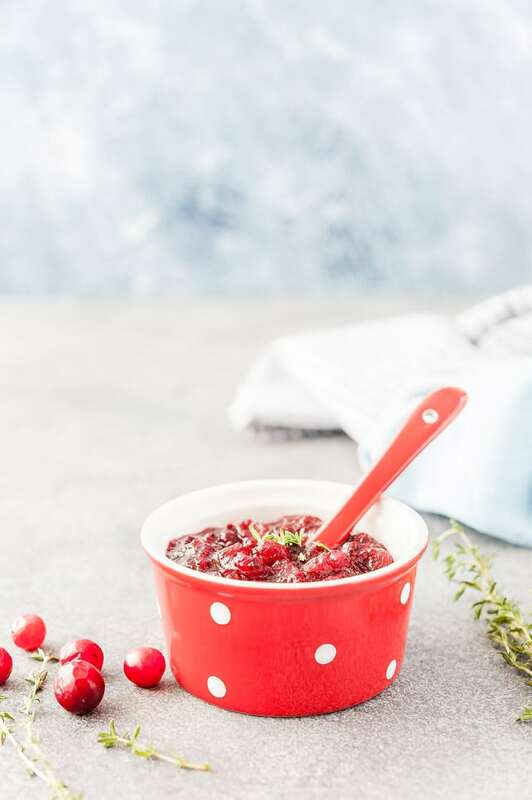 Making this delicious sweet and tart Maple Cranberry Sauce in Instant Pot (or another Electric Pressure Cooker) means that you don’t need to stand at the stove and stir the sauce while it cooks. 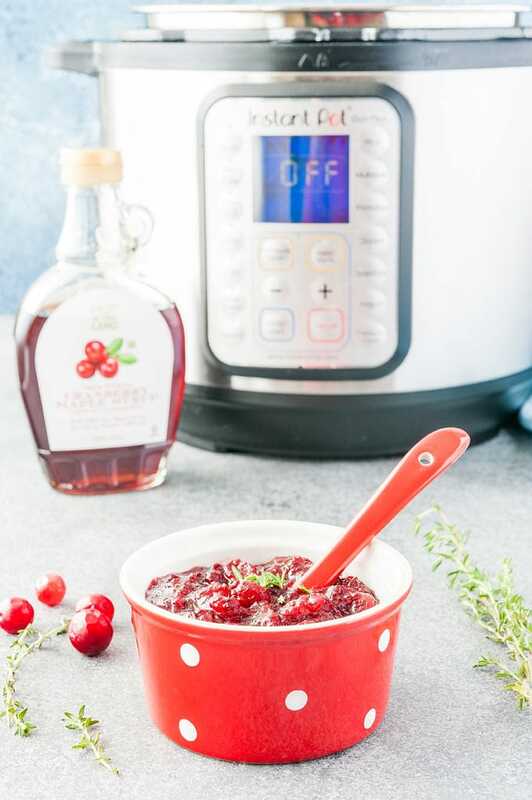 With the time it takes to come to pressure and naturally release the pressure, making Instant Pot Maple Cranberry Sauce may not be much faster than the stove method, but it is a lot more convenient. There are only four ingredients and one of them is optional and another is semi-optional. 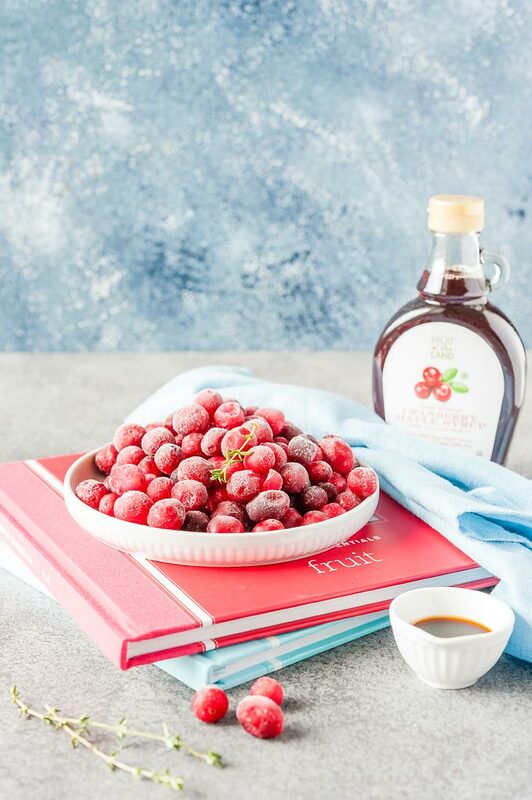 What is Cranberry Maple Syrup? It is a very unique and delicious product by a local store called The Fruit of The Land. If you ever have a chance, visit the store as it’s absolutely gorgeous and filled with a lot of delicious goodies. 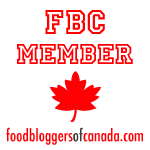 Their Cranberry Maple Syrup is sweet and tart at the same time and has a wonderful taste of cranberries. 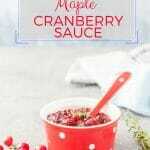 It’s delicious on pancakes and waffles and a great addition to my Instant Pot Maple Cranberry Sauce. 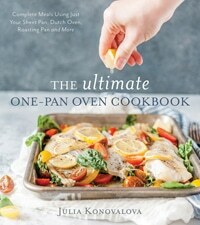 It’s so easy and it requires almost no hands-on cooking. Add the cranberries, maple syrup, and thyme, if using, to your Instant Pot. Turn the Instant Pot to sauté and mash the berries lightly. Cook for about 1-2 minutes. NOTE: This Maple Cranberry Sauce gets sweeter as it cools. Wait, don’t you need water to cook in Instant Pot? 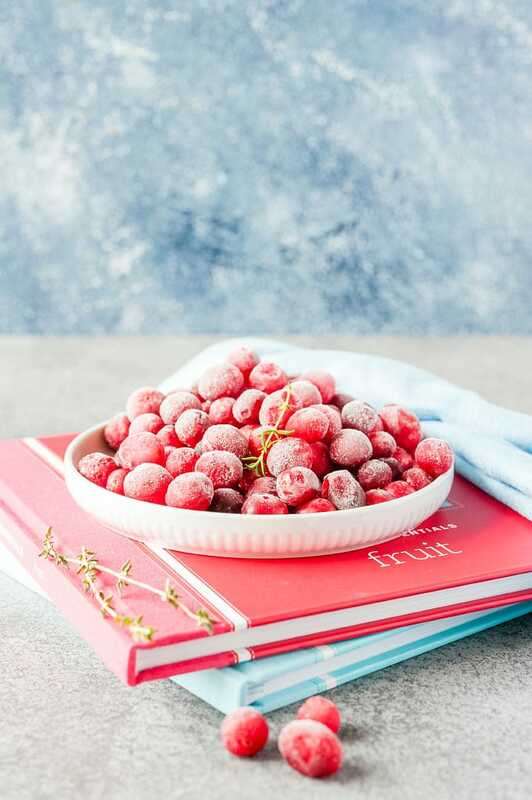 I use frozen cranberries which release a lot of liquid while they thaw and the berries are also quite watery and juicy, so there’s enough liquid for the Instant Pot to come to pressure. Keep in mind that different models of electric pressure cookers behave differently. My Instant Pot doesn’t display the dreaded burn message but I know that some other models notoriously do that often. I like to turn my Instant Pot to sauté mode while I measure out the ingredients, it makes the pot hot and that helps it to come to pressure faster. It usually saves about 2-3 minutes of coming to pressure, thus making the whole process a bit faster. I have not tried doing a quick release for this recipe, mainly because of my experience with Instant Pot Strawberry Chia Jam and the foam and juice spouting out of the vent right after cooking with quick release. If I were to guess, quick release most likely would be fine with this Instant Pot Maple Cranberry Sauce because it makes so little. 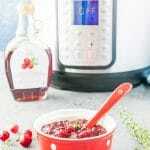 This recipe for Instant Pot Maple Cranberry Sauce is a small batch recipe. It only makes 1 cup of the sauce. You can store this Cranberry Sauce in an airtight container (or a mason jar like I usually do) in the fridge for up to 2 weeks. You can also store it in a mason jar in the freezer for up to 3 months. Defrost in the fridge overnight. Most likely the recipe would work with fresh cranberries but I haven’t tried myself. As I mentioned above, I use Cranberry Maple Syrup by The Fruit of the Land and it’s amazing. It adds an extra cranberry intensity to the Cranberry Sauce. I have made this recipe with regular maple syrup as well. IMPORTANT: this Maple Cranberry Sauce is not overly sweet. It’s more tart than sweet, so you may want to add more maple syrup (an extra 1/4 cup). If you add more maple syrup, you might need to sauté for a bit longer at the end to thicken the sauce. 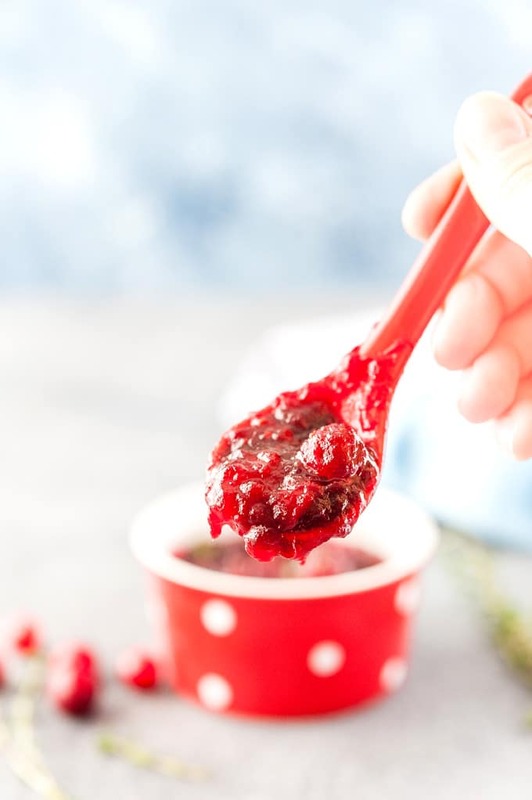 Cranberry Sauce gets sweeter as it cools. I used thyme because that’s what I most often have on hand. 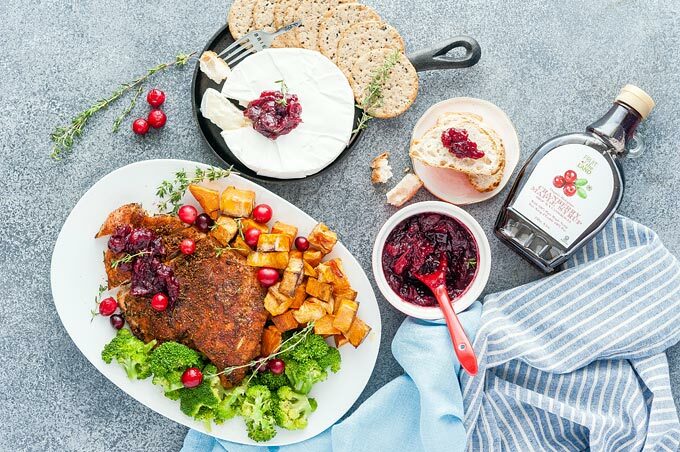 It adds a wonderful light savoury note to the Cranberry Sauce. Try adding different herbs for different flavours: rosemary, oregano, savory. You may omit herbs altogether. It adds a wonderful zing and brightness to the sauce. Such a small ingredient but it brings the sauce to the next level. I highly recommend using it but it can be omitted as well. Turkey and Swiss Sliders with Cranberry Sauce from my book, The Ultimate One-Pan Oven Cookbook, page 107. Optional step: turn sauté function on so that Instant Pot heats up while you measure out the rest of the ingredients. Add the frozen cranberries, maple syrup, and thyme, if using, to Instant Pot. Turn the sauté button off if using. Put the lid on and turn the vent into the sealing position. Press Manual or Pressure Cooker button (depending on your model) and using the arrow buttons set the cook time to 2 minutes. Depending on whether you turned Instant Pot to sauté in the first step or not, it would take between 4 to 8 minutes to come to pressure. Once the Instant Pot beeps that the 2 minutes of cooking are done, let the Instant Pot release the pressure naturally. That will take between 8 to 10 minutes. Open the lid and turn sauté function on. Remove the sprig of thyme. Add the balsamic vinegar and mash roughly. Cook on sauté for no more than 1-2 minutes, just until the sauce starts to thicken. It will continue to thicken as it cools. Serve with fresh thyme leaves. Store in the fridge in a mason jar for up to 2 weeks or in the freezer for up to 3 months. This Instant Pot Maple Cranberry Sauce is not very sweet. If you like sweeter Cranberry Sauce then use up to 1/2 cup maple syrup. You might need to cook on sauté in the end for longer to thicken the extra liquid. This Cranberry Sauce gets sweeter as it cools. Feel free to add more thyme or use other herbs like rosemary. Or omit the herbs.